Introducing the all new 110mm f2.5 Macro Apo-Lanthar lens from Voigtlander - a 1:1 macro lens designed exclusively for full frame Sony E-mount cameras. The Voigtländer MACRO APO-LANTHAR 110mm f2.5 is a 1:1 macro lens designed exclusively for full frame Sony E-mount cameras. The APO-LANTHAR designation is given to especially high performance lenses in the Voigtländer lens lineup, with APO being derived from the apochromatic optical design. A need for apochromatic optical designs that reduce the longitudinal chromatic aberrations of the three primary colours (RGB) of light to practically zero arose with the increasing popularity of colour film. Now, with the current range of high-resolution digitals sensors, this need for extremely high-level control of chromatic aberrations is even more pertinent than when film changed from monochrome to colour in the middle of the 20th century. So rather than just being for already solved old technology, apochromatic optical designs are indeed a subject requiring serious consideration in the digital age. 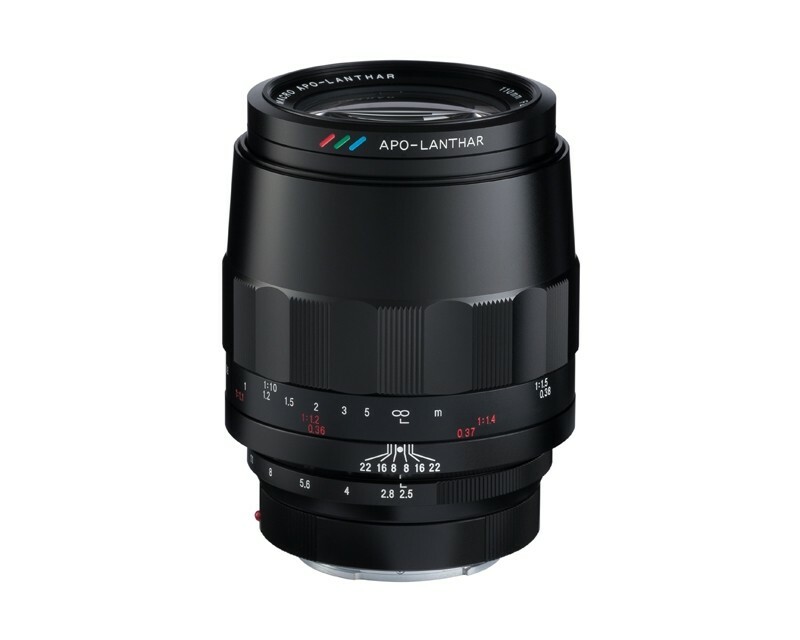 Retaining a similar form factor to the highly regarded Voigtländer MACRO APO-LANTHAR 65mm F2.0 Aspherical released in August 2017, this lens covers the full frame image area, and achieves a maximum image reproduction of 1:1 life size without the need for attachments. In order to ensure subjects from minimum focus distance to infinity are captured with extremely high image quality, a 3-group floating mechanism is employed to adjust three optical groups. Another attractive feature is the ability to create images with a strong out-of-focus ‘bokeh’ effect, made possible by the 110mm focal length and F2.5 maximum aperture. This lens is a manual focus and manual aperture design, but also features electrical contacts for storing exif data. Furthermore, the lens is installed with a distance encoder to enable support for 5-axis image stabilisation on bodies with this feature, by providing distance to subject information used to compensate for camera shake. Focus peaking while manual focusing is also supported.